Tant que mai n’est au 28, l’hiver n’est pas cuit. Until May 28, winter is not cooked. École du Breuil, Paris 12e, photo by Alain Delavie. 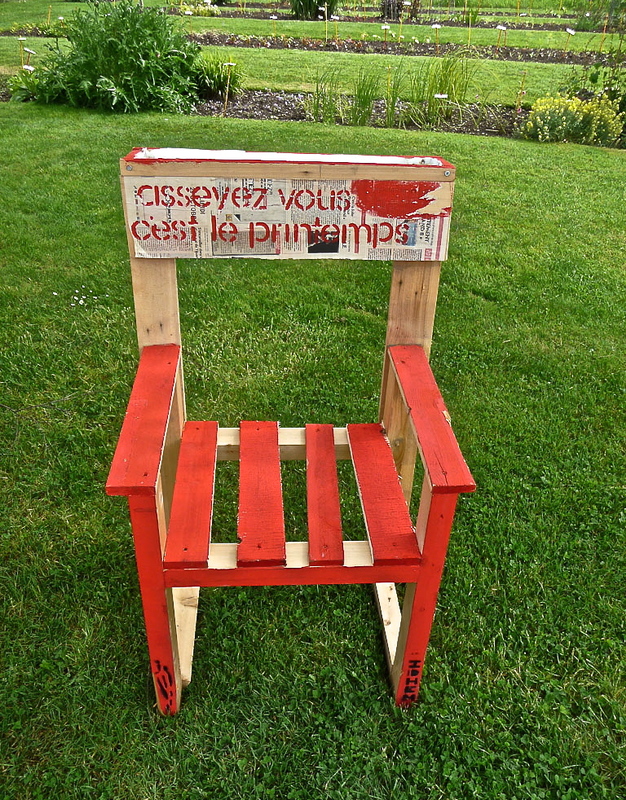 This is the message of a charming chair at the Ecole du Breuil in Paris. The photo is by Alain Delavie* from his blog Paris côté jardin (Paris garden side). However, in his post on May 26, Delavie noted that the temperature was “hardly conducive to lazing in the shade of a tree … more to a jacket and mulled wine.” Indeed, Paris had record cold weather for the end of May. Today, the temperature will be around 14°C or 57°F — pretty chilly. Paris côté jardin is a wonderful resource for gardeners preparing to visit (or even luckier, live in) Paris or the Ile-de-France. Delavie is the editor of Rustica Hebdo magazine and editorial advisor to www.rustica.fr. Equally impressive, he is a member of the European Network of Master Composters. The school enrolls 300 students at a time: 200 in the classroom and 100 in apprenticeships. Its grounds and facilities include an arboretum, heritage orchard, greenhouse, many plant collections, and library. As gardeners, surely we have done our duty once we have registered our disapproval at the general arrangement of the universe, with complaints of special sharpness directed toward the clumsiness — indeed, sloth — with which wind and rains are scheduled. It is all that can be expected of us. The rest is the full responsibility of the heavens and need not, therefore, concern us. It does seem to me odd, nevertheless, that this “Nature,” which is supposed to be so wonderful, so rarely lets anything come to full perfection. It is all designed on the frog in the well principle, two hops forward and one backward until a certain level is reached, then the whole thing collapses. That is all anybody needs to know about nature. *Used here with his kind permission. Cindy, I love the message of this chair. May has also been cold (and wet!) in Maine, with high temperatures many days only in the 40s (F). Then we got a couple of “normal” May days, sunny with temperatures close to 70. I guess those two days were spring, because we’re supposed to get thunderstorms tomorrow with temperatures in the 90s on the back side of them! From too cold to sit outside to too hot to sit outside in one week can give even a New Englander whiplash. My husband came in from watching the news day before yesterday and said, “it’s snowing in Vermont.” It’s very strange. Last year, we were in Wisconsin, D.C., and France — in mid-March — and it was in the high ’70s. This year, I think Wisconsin and France have struggled to get to the 60s in May. Here in Rwanda, it’s almost always between about 70 and 85 during the day. I do sometimes miss “jacket” weather, but never really temperatures in the 90s. Thank you so much Cindy. Always so cold here in Paris… Sad spring !!! I hope you will be compensated eventually with a really beautiful summer. Cindy, it was cold in London, too. I wore a parka almost the whole time I was there. I made it to the Garden Museum. Thanks for the suggestion. I thought the very traditional garden there was charming, and the restaurant was good. I hope there was a little green beside the boxwood, with the cold. Yes, indeed, May has been a wet, cold month everywhere I have been. There was even a hail storm in Tuscany on May 25th! With June looming, I hope it brings seasonal weather. In the Washington, D.C., where we have a house, it’s already been in the 90s and some are predicting a really hot summer again. I guess we may need to change our expectations about the way the seasons proceed. This past winter in Rwanda, which should have been the short dry season, it rained every 3-5 days. But this month, which should still be the (end of) the rainy season, it stopped raining mid May. I am so interested to know what you grow in your garden in Rwanda. I will look forward to reading about that on your blog, which I am enjoying. No matter where we are in the world, the weather will affect our gardens! I hope soon to add a page to this blog with photos and names of all the plants in my Rwanda garden. Also, after declaring the rainy season over (just above), we had a really nice rain about 6 this morning.